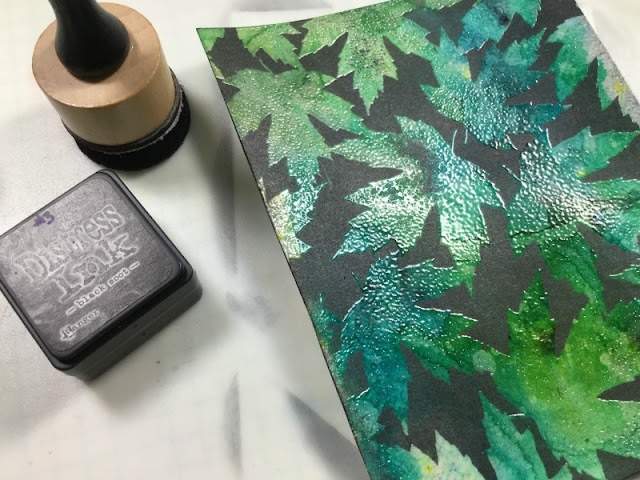 It's All Cut and Die: Scrap "n Stamp Canada "LEAVES" Blog Hop!!! 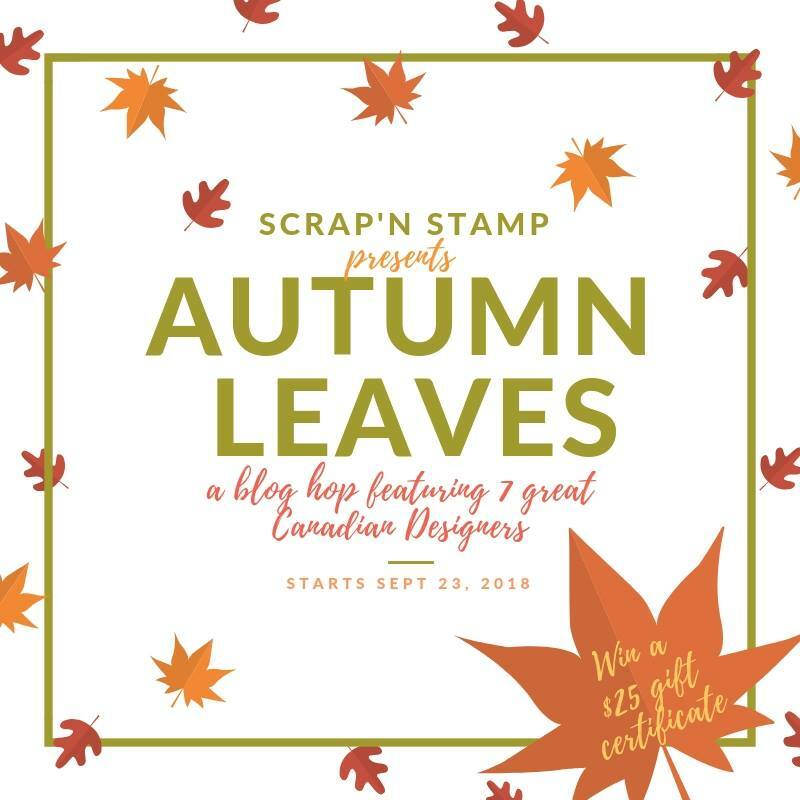 Scrap "n Stamp Canada "LEAVES" Blog Hop!!! 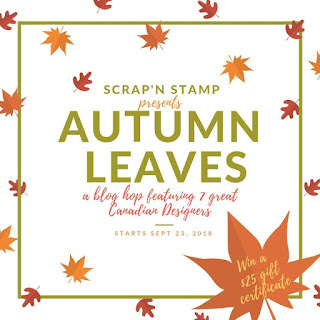 The design team for Scrap 'N Stamp Canada has come together for another fabulous blog hop!! You likely arrived from KAREN. If at any point you get lost along the way, you can find the entire list HERE! Our theme this time around is "Leaves" and how fitting because where I live the trees are beautiful right now!! Unfortunately, these colours don't stay for long and then it's onto at least 6 months of the white stuff...yuck. But for now, let's celebrate those gorgeous leaves!! I made three cards for you today. 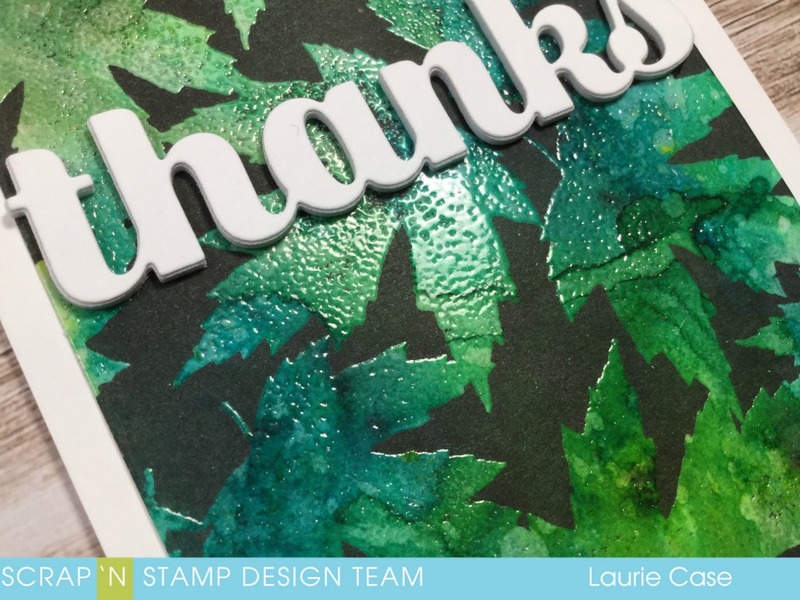 Maybe a little overboard but once I started creating with the Cover-A-Card Fall Leaves Cling Stamp. 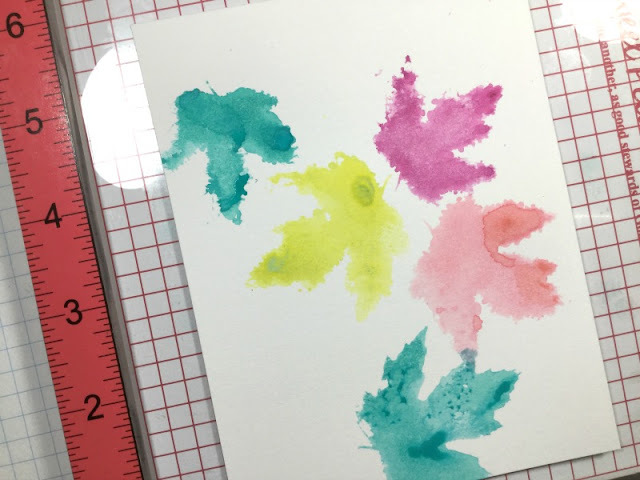 This stamp is fabulous for techniques!! The first technique was to stamp with watercolours. 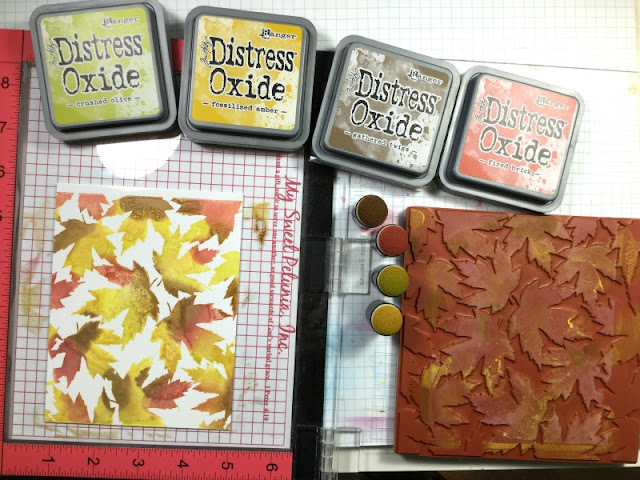 In this case, Distress Oxide Inks. I literally just slapped on some watered down ink onto portions of the stamp and pressed it into some Mixed Media Paper. 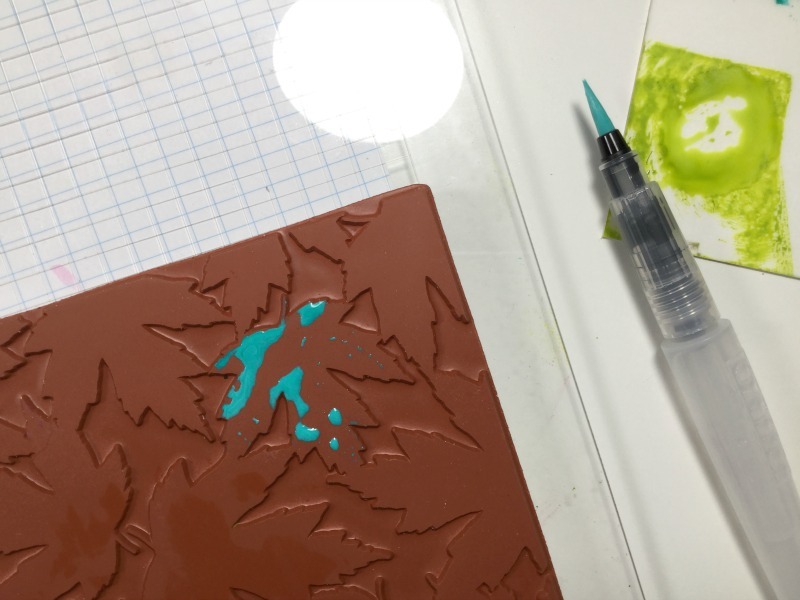 Tip: the Misti or any other stamp positioned tool is a must for this! I started by trying to cover one entire leaf at a time but as you can see, the ink just pools. I ended up applying the ink a couple of times and pressing down. As you can see, I used non-traditional colours. I chose Peacock Feathers, Worn Lipstick, Picked Raspberry and Twisted Citron Distress Oxides. After the stamping was done, I trimmed this panel down but before adhering it to a card base, I stamped the entire background stamp onto the base using a light grey ink. 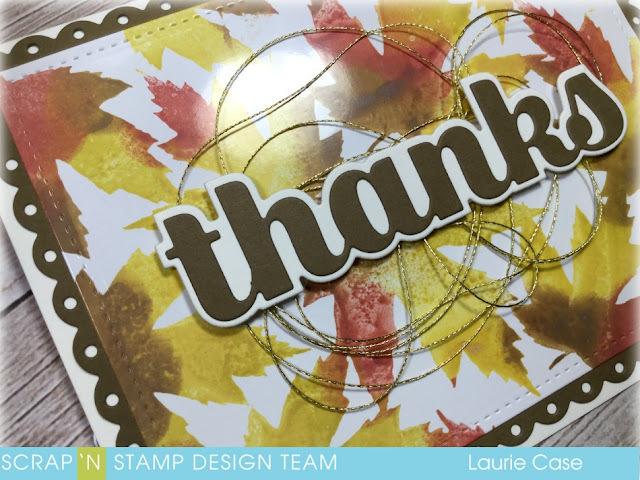 The large "thanks" word die is from Birch Press Designs and is called the Big Thanks-Sugar Script Die. It's awesome!! A few clear sequins and shimmer pen finished off card #1!! For my second card, I again used Distress Oxide Inks but in Fall colours. I used Gathered Twigs, Crushed Olive, Fossilized Amber and Fired Brick. This time I used sponge daubers to apply the ink. I love using sponge daubers to ink up stamps, it's so easy to get many colours on one image and Oxides blend beautifully!! Now this is where the fun comes in!! 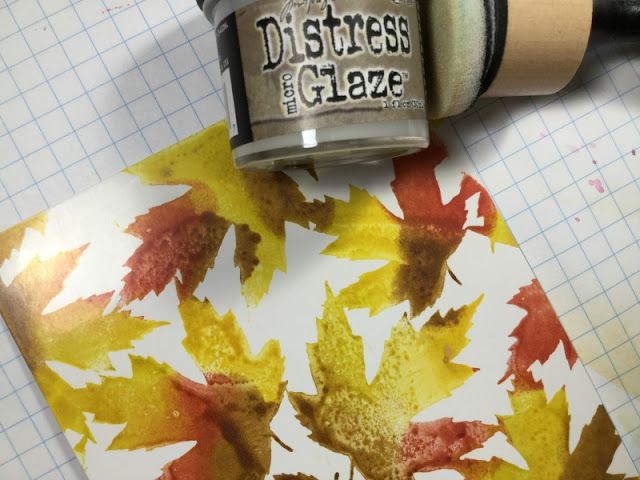 I used Glossy Cardstock from Ranger/Tim Holtz to do the stamping because I knew I wanted to use the Distress Micro Glaze over top. 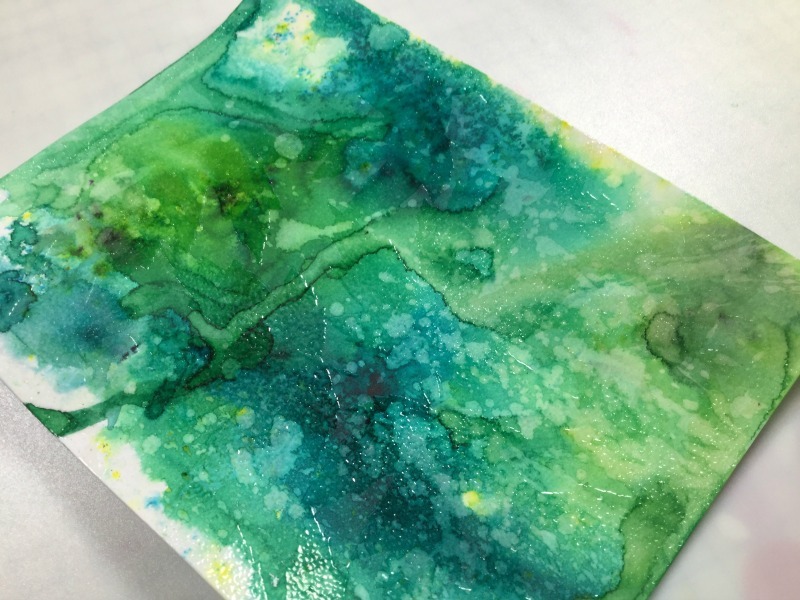 Once the Oxide Inks are dry, take a blending tool and sponge and rub a SMALL amount of the glaze over top. The colours brighten and pop off the paper!! This only works on this particular paper!! It is just gorgeous in real life!! I trimmed this panel down with a Lawn Fawn Stitched Rectangle die and mounted it onto a brown panel cut with a Fancy Scalloped Rectangle Die (also from Lawn Fawn). Then everything was mounted onto an ivory card base. I used the same sentiment die but also added a nest of gold thread behind it. I think this card turned out beautifully. What do you think?? Okay, now onto my last card and I know there is a name for this technique, I just don't know it!! I used Tim Holtz Distress Watercolour Cardstock for this one as I knew I was going to use A LOT of water! I took out my Ken Oliver Colourburst to play with. I have the Caribbean Brights Set. I used only the three greens. Once my panel was good and dry, I added a lot of anti-static powder to it and clear embossed the entire background stamp. It's difficult but you may be able to see some shine in the embossed areas. I then took Black Soot Distress Ink and put a heavy layer over the entire panel. This gives a beautiful effect. The panel is black only where there is no embossing powder. When you are done, all you see is the leaves with that gorgeous colour! To finish this card off, I simply cut down the stamped panel and foam mounted it to a white card base. 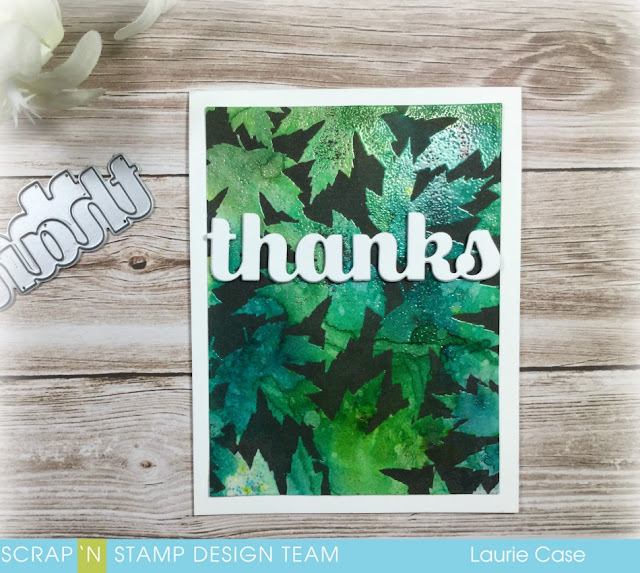 I used the same "Thanks" die which was also mounted with foam adhesive. I think this may be my favourite one of the three! Three very different cards using the same stamp and die, I love when that happens!! Which one is your favourite? I'd love to know!! Up next on the hop is the crazy talented JESSICA!! Scrap 'N Stamp is generously giving away THREE $25 gift certificates to the SNS store!! All you have to do is leave a comment on each stop of the hop. You have until September 30th to comment and winners will be announced on the SNS Blog on October 2nd, 2018. Good Luck!! Wow!! I love all the cards! Love seeing the Color Bursts used! Gorgeous cards ... I do have that background stamp, which is on that never ending wish list! Simply stunning! I want to go try this!! THank you for the inspiration! these cards are beautiful... I thought my favourite was the 2nd card with the microglaze then I got down to the 3rd and I loved the way it turned out. I must try these techniques ! WOW 3 fantastic cards! I really like all the different colors and techniques that you used for each card too! Some techniques that I am now going to want to try out too! Beautiful cards! 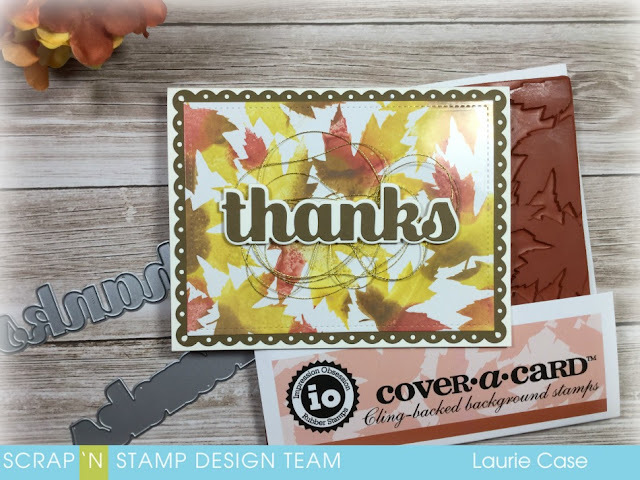 I love the Fall Leaves stamp you used! The second card with the fall colors is absolutely gorgeous! Great techniques to try! Gorgeous cards! I really like the fall colours on the second card. Each card is beautiful in its own way, but I have to say I agree with you - the third one is my fave. Decades ago we called that technique Joseph's Coat. 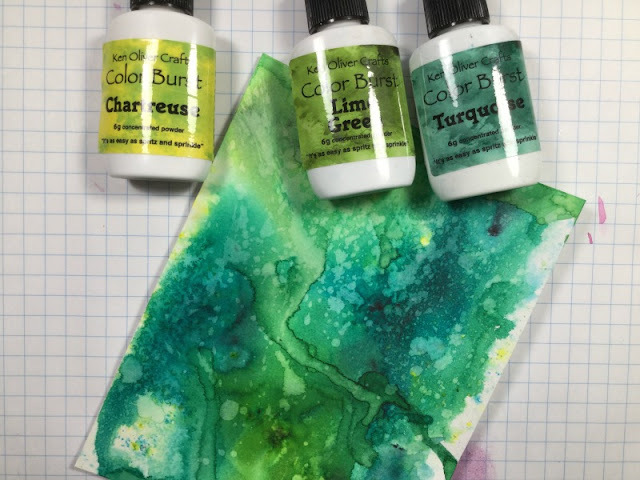 My Creative Time 83rd Edition Release Blog Hop!! Pink & Main Sneak Peek!! Manly Monday with My Creative Time!